This set of a hundred flameless candles creates the subtle, inviting ambiance tea lights are known for without the worry of messy drippings, quick burn-out, or open flame. Arrange among centerpieces for an event or throughout your home during the holidays for a charming glow. Description: Bulk set of 100 plastic white tea lights with 1 bright glowing amber LED in each light. These lights create the ambiance desired without the hassle. Made from a water resistant durable plastic, these tea lights will rid you of all the annoyances you may have with the traditional tea light. No need to clean up spilled wax, worry about the smell of smoke, these flameless tea lights are made to fit your every need. Application: Our flameless LED tea lights are perfect for decorating large spaces! 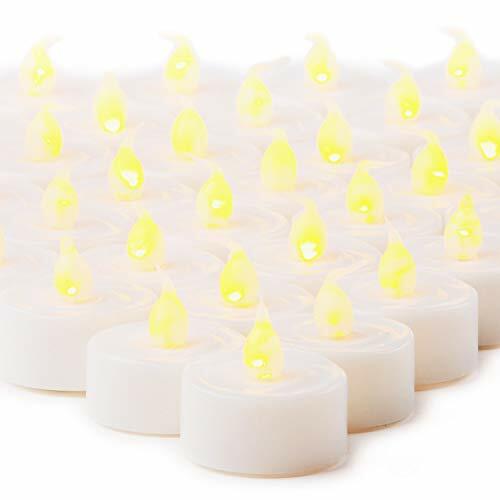 Whether it be used indoors or outdoors, for your home,wedding, party, or corporate event these tea lights are the perfect choice for adding that ambiance danger free and hassle free! These tea lights are also a great gift for your friends or family around the holiday season! Includes: Each tea light comes with a pre-installed CR2 battery that could be switched ON or OFF with a simple switch. Batteries are easily replaceable via the tab located on the bottom of the light. Dimensions: Tea Light Dimensions: 1.5" D x 1.25" H. Safety: Lamplust is always looking out for your safety, our LED technology allows these lights to remain ON for long periods of time while remaining cool to touch. Safe for children and animals. Warranty: LampLust is looking out for your satisfaction. If you have any questions, issues, or concerns please contact us and we would be more than happy to assist. These tea lights have a 90-day warranty.